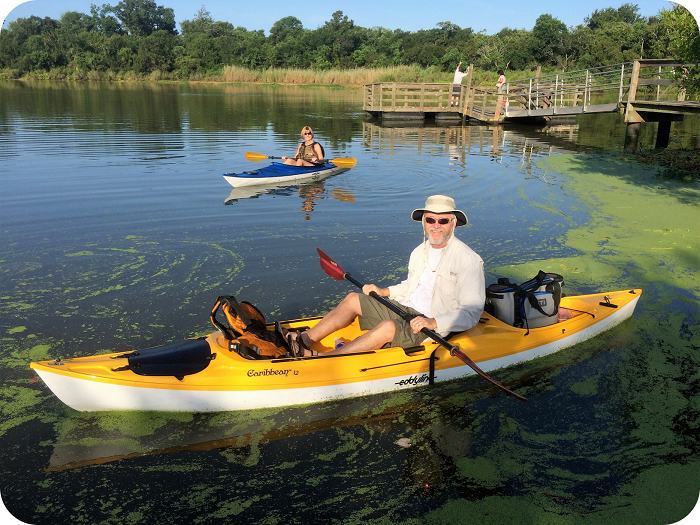 One of our favorite Houston area kayak tours, our Armand Bayou Kayak Tour is an easy flat-water paddle and rich in natural beauty! The bayou, while surrounded by urban development, remains one of the few relatively pristine waterways in the Houston area. It's unique character was recognized when it was designated as one of only four Coastal Preserves found along the Texas Coast. Lands adjacent to the bayou provide a glimpse of riparian coastal flatland forest and tall grass prairie habitats that were once abundant in the area. The area is rich in wildlife and is known for a diverse bird fauna where more than 220 species can be found. Common birds seen in the area include osprey, roseate spoonbill, egrets, herons, pelicans and many others. Our put-in is the boat launch at Bay Area Park. Restroom and picnic facilities are available at the put-in. We’ll paddle south 3 miles to the County Park at Mud Lake, where restroom facilities and picnic facilities are available for a mid-trip break. Relax and watch the local rowing club and wind surfers on Mud Lake before returning to Bay Area Park in the second single kayak of your choice. Participants in double kayaks will return in the same kayak.